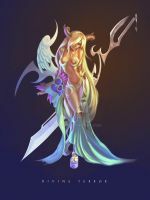 Ahh... this an old work since 2003 for Arcana online Game base on Tarot card..
Wow, the skin looks great! Woah beautiful !! Great coloring ! I love the designs and colors. The detail here is mind boggling... awesome color. you have a whole heck of a lot of talent. amazing work, I adore colors you've used here. GREAT!!!!! so beautiful done! this is inspiration di lux! simply one of the best illustration i have seen. I fav it O_o. sorry about my bas english. lol. naked our not. its a really good pic. >3 its shiny and blinding. lol. shes cool too. She's just beautiful! I love your version of this card. Thus a beauty is born! very nice picture I love it! Could you do a tutorial on colouring please? I would love to do colouring like yours. That is really beautiful! So pretty! I love the colors and the background and how you depict 'The Star'! I'm looking foreward to some other tarot cards you may make! Very beautiful. I love the design and the colors that you chose. The symbology is just fantastic. Great job. i think the word you're looking for is symbolism. syyymmbolism. No, I definitely meant "symbology". But symbolism works too. Wow. Beauty in the truest way. A lovely rendition of the star card. Well done with all the traditional symbols included and intact. Truly well done. I love this pic. Tarot is a small passion of mine and I would definately buy these as tarot cards if they were available. Your style and colour is amazing. This is such a Beautiful Beautiful Beautiful Peice of art. I love how you put the water in with the legs And the stars above her head and all her wings/feathers. beautiful picture :0 i love how you colored it. Wow thats so incredible! its so awsome and the back ground is so great as well , Great work! This is so beautiful i want to EAT it! !